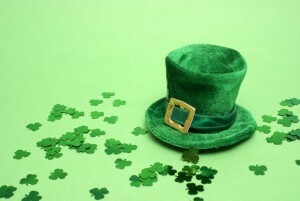 March may come in like a lion and go out like a lamb but in between there is St. Patrick’s Day! Celebrate Irish heritage at these fun events happening at U.S. military bases throughout the world. Whether you want to enjoy some traditional corned beef and cabbage or test your cardboard boat making skills, there are lots of ways you can get into the spirit! Dress to impress in your festive holiday outfit and join the St. Patrick’s Day 5K Fun Run/Walk. This family-friendly event is free of charge and open to all ages. March 18, 10:30 a.m. – 1 p.m. Compete in this St. Patrick’s Day 5K for a chance to win Commander’s Cup points. Refreshments will be served. March 12, 9 a.m. – 12 p.m.
Bring some fun and luck your way with the St. Patrick’s Day Shuffle and Geo-cache. This is a 5K run and a Geo-cache styled leprechaun treasure hunt for families and beginner geo-cachers. First 500 to pre-register will receive a free T-shirt. March 13, 11 a.m. – 2 p.m.
Eat, drink and be merry at the Fort Hamilton Community Club’s St. Patrick’s Day Lunch & Dinner buffet. Reservations are recommended. Celebrate the Luck of the Irish at Tropics. Dance, eat, and wear something green. March 17, 10:30am – 5 p.m. The whole family can enjoy bowling at Orote Point Lanes. Wear green and rent a lane for $5 an hour. Stop by between 5 – 8 p.m. and receive a Corned Beef & Cabbage with mashed potatoes dinner special for just $10.25. Enjoy live music and take advantage of beverage specials. Create a boat out of cardboard and duct tape and join the first ever St. Patrick’s Day Command Cardboard Boat Regatta. Awards will be given in several categories including the Titanic Award for the most dramatic sinking.